Diminishing Return – Benefits that beyond a certain point fail to increase in proportion to increased efforts. In automotive-speak diminishing return typically refers to the relationship between power and overall performance. The idea being that simply adding more power doesn’t always parallel with improved performance. 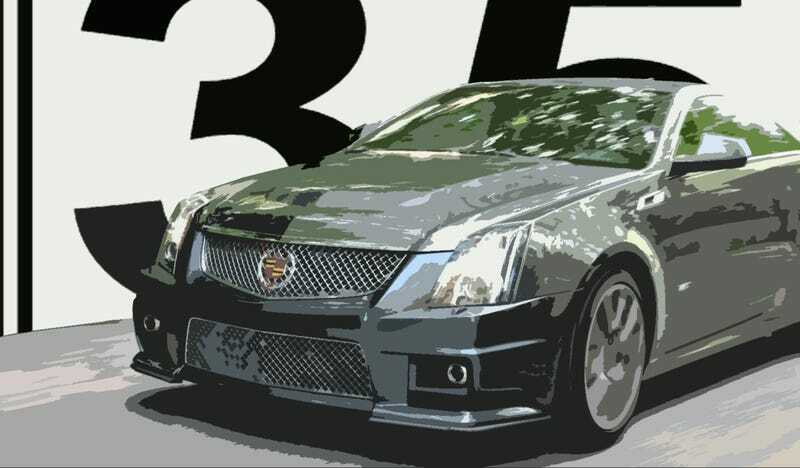 This was a concept I became very familiar with last year after buying and modifying a 2009 CTS-V.
My drive into work - 4.6 miles, 6 stoplights, 5 90-degree turns – all on a stretch of asphalt besieged with 35 MPH signs. It was a boring drive and one that I would do five days a week. Like dating a bikini model and living in the more frozen part of Canada, I rarely got to show off her goods. Cars like the CTS-V are contrived and engineered for the track. Their performance claims are center to their marketing message. But how many of these performance cars ever see a race track? I would wager very few. Mine being one of those. Run-of-the-mill commutes turn otherwise mind-blowing performance cars into utter bore-orollas. One’s automotive needs would be better served reading a car magazine while riding a bus. That’s not to say these cars aren’t unbelievably impressive pieces of machinery. Given a track cars like the CTS-V are guaranteed to invoke a Joker-sized grin. But if you spend a preponderance of your motoring in a lifeless commute experiencing only the ostentatious side of these cars, neglecting their genuine motoring potential, is it fair to the car/you? Does the occasional freeway-merge make up for a week of monotonous motoring? How can a machine of this motoring dominance be so damn dull? Has performance gotten to the point that it has diminished actual motoring satisfaction? These are questions I found myself asking. A friend of mine once said, “sometimes it’s more fun to drive slow cars fast, then fast cars slow.” He was right. The CTS-Vs of the world are spellbinding machines, when pushed. Hard. It’s what they were built to do. But in the daily ho-hum world of life on the road – they are boring; heavy, unexciting and inefficient. Maybe if I could deactivate 6 of the 6.2 liter’s 8 cylinders, I could have found driving pleasure without being over the posted limit. 0-60 in 3.9 seconds is a mind-boggling number, but 0-35 MPH isn’t nearly as exhilarating nor is it practical in DC traffic. Then it dawned on me. These cars are about more than going fast. They’re about bragging rights and brand flamboyance. What could-be. They’re about having the best a brand has to offer and proudly displaying the badge that says such. SVT, SRT, AMG, V, RS, M, GT, F, Z or any other performance specialty nomenclature, buying one sends a loud and clear statement to Corporate Automotive. That message: Build the bold, design the audacious, engineer the over-powered. Most track-breed vehicles on the road will never clip an apex, mow down a line of orange cones or sit in a burnout box. But rather than judge those drivers, thank them. They are the reason the motoring society at-large continue to see one performance masterpiece after another born onto the roads of this world. These cars will eventually find their way into your driveway. Like adopting a caged animal, you will be obligated to feed it, love it and in this case let it run and frolic on big asphalt playgrounds. It’s why they were born. It’s what they deserve. *Note: This is an updated version of a post I wrote in July 2012. My CTS-V is now gone. While I do miss it, I know it’s in good hands and is getting plenty of ‘outdoor time’.